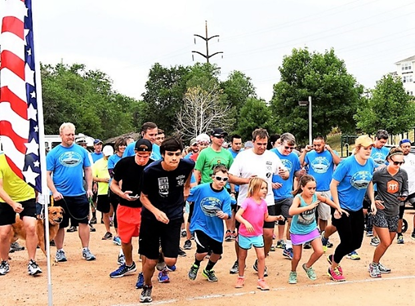 Colorado Springs ranks highly in lifestyle surveys, justifiably, but little did we know that we are a national and global destination for those participating in fund-raising 5K Walk & Run events! The 6th annual Sertoma HEARS 5K was held Saturday August 6, 2016 with great participation and outcome. 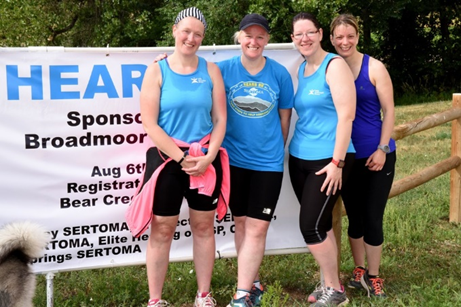 Even with the early morning monsoon cloud cover there was a great turnout - and our superb sponsors raised funding to support the Hearing Education and Assistance by Rocky Mountain Sertomans (now H.E.A.R.S.) program. “This year’s event will provide funding for over $45,000 worth of hearing services and aids for needy El Paso county residents”, according to Hal Moffat, event Director. The 5 Kilometer - about three mile - course took runners and walkers through perfectly prepared and beautiful Bear Creek Park. But very unique this year was the participation of the entire Kossover family from Wichita, Kansas, plus Pamela Burue and Donna, Paula and Gemna Roddy - all from Ireland! Both groups were in The Springs for multiple purposes but after seeing the Sertoma event in coloradosprings.com they wanted to be involved. And, WOW, did they participate! The First Male Finisher was Etan Kossover, the First Female Trophy went to his sister, Mia, and young brother Harris also completed the run in great time! And the Ireland team? Jet lag never slowed them and they finished strongly together before heading to the after-event party. The youngest Male Finisher was Jameson Fitzpatrick, while six year old Tatum Lee White got the youngest Female Trophy. Finally, our most enthusiastic Trophy winner was Bev Limbaugh, our 76 years young ‘oldest’ finisher! While a fun event, the purpose is serious. “Like most fund raising events, great sponsors provide most of the money that is raised”, Dave Cooper, the event Treasurer, noted. Title sponsor Broadmoor Audiology was joined by multiple local Sertoma clubs, Elite Hearing of Colorado Springs, Colorado Springs Health Partners and the Hearing Loss Association of America to meet this years’ goal – “truly a wonderful giving-back to the community” said Dave. HEARS provides over $250,000 value of services and hearing aids annually. Established and operated entirely by local Sertoma volunteers since 1988, HEARS assisted its 2,000 client in December of 2015. Several HEARS clients spoke and thanked everyone for their support at the event. Dianne Reitan, currently Development Director for Partners in Housing, was first served as a teenager by HEARS, then returned as an adult client after losing her job in the 2009 recession. “My new replacement hearing aids from HEARS definitely helped me get a new job”, she explained. Susan Burns had also received her new hearing aids just the prior week, and was very movingly thankful to those who supported the HEARS mission. Donated gifts and prizes by local buinesses is also a major draw for those participating. Blessed with a fireball donor organizer, this year’s HEARS 5K had eight Lucky Draw prize packages valued at over $300 each, open to all registrants by random draw. “The local business community support is just phenomenal”, said Donor Volunteer Christy Gate. “We had hotel stays, many different restaurants, sporting events and local attractions participate”. Awarded during the After-event Party, the Lucky Draws, gift bags, complimentary food, and trophy awards kept the strongly positive energy of the event going long after the final finishers crossed the line!